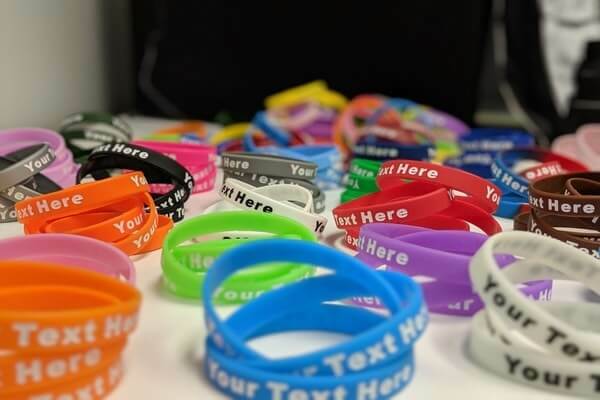 At Rapid Wristbands, we offer several different high quality wristband styles that can be customized to fit your needs. Each wristband is made of the same, cost-effective 100% latex-free silicone. Each style is dependent on what you create. We have designed over 100,000 unique custom wristbands for our customers and continue to create more. Our printed wristbands have custom messages screen-printed onto the silicone. These are our most economical wristband type, but remember that the ink printed can be worn away by friction, water, and/or soap. Our ink-injected wristbandsare a step up from the printed wristbands. They feature a debossed message filled with the ink color of your choice. This protects your message from daily wear and tear. Our debossed wristbandshave messages that are carved into the silicone. Because of this, the bands will last for years to come. Our embossed wristbands, unlike debossed, feature a raised message. You can also get embossed printed wristbands, where they are the same as the embossed, but the message gets a colorful layer of ink printed over the lettering. This option also allows for braille messages, as your font will be raised. The color coat wristbands are dual-layer wristbands made using a two-tone color scheme of your choice. This allows your message to be etched out of the outer silicone layer so that it shows the color of the inner silicone layer. Our blank wristbands are simple, wordless bands ordered in the color of your choice. These are beneficial for crowd control and mass group events. In addition to silicone, we also carry Tyvek® wristbands, which are paper wristbands that come in sheets of 10 and have a one-time use, peel-off adhesive liner for quick and easy application. For any custom wristband questions, please contact us. Our top-of-the-line customer service representatives would love to help you design your perfect wristband.